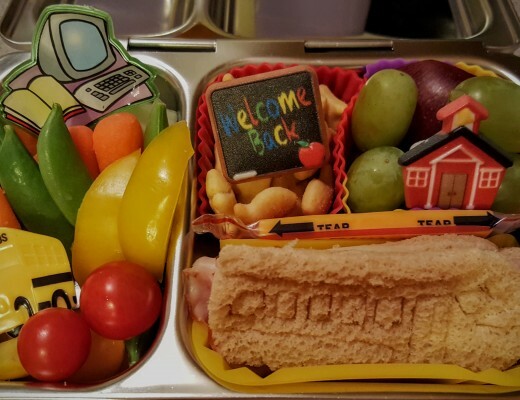 It’s Back to School time for many families and for many that means figuring out how to fill lunch boxes day after day after day. 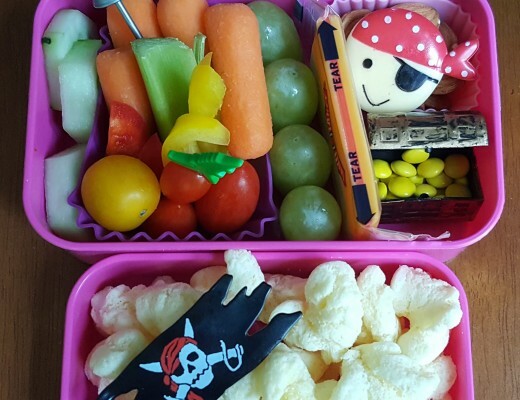 In this post, I will share a week of lunches my kids ate at elementary school. 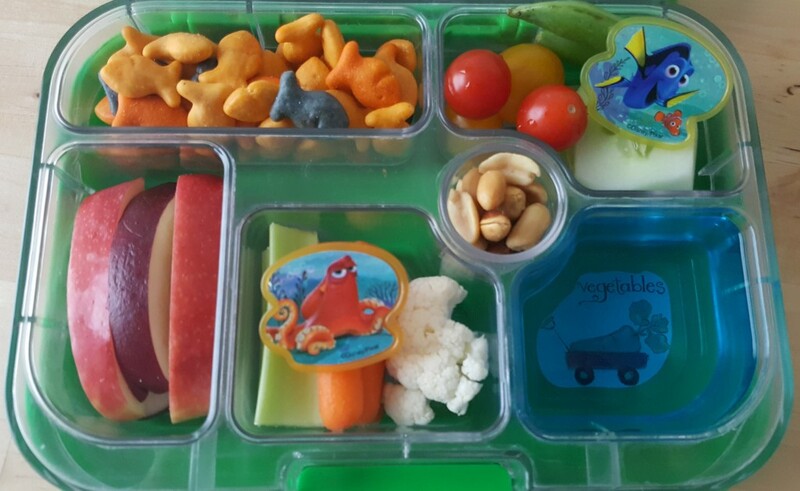 The lunches above and below were packed in our Planetbox Shuttles. 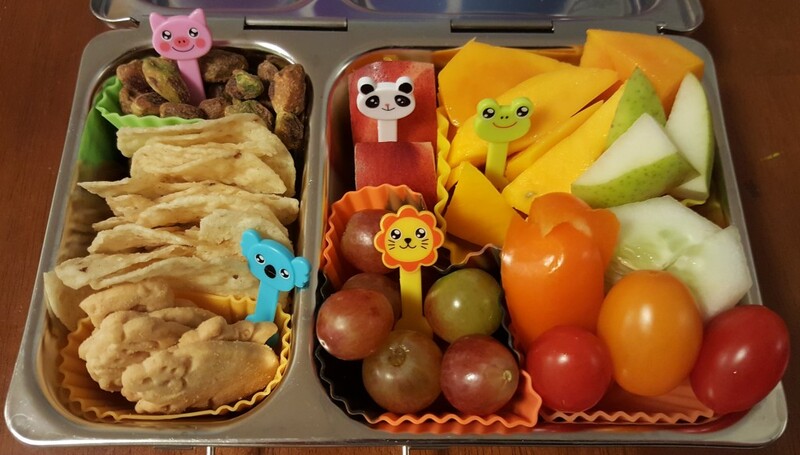 They included tortilla chips, a few animal crackers, grapes, tomatoes, orange pepper slices, cucumber wedges, pear slices, and white nectarine slices. 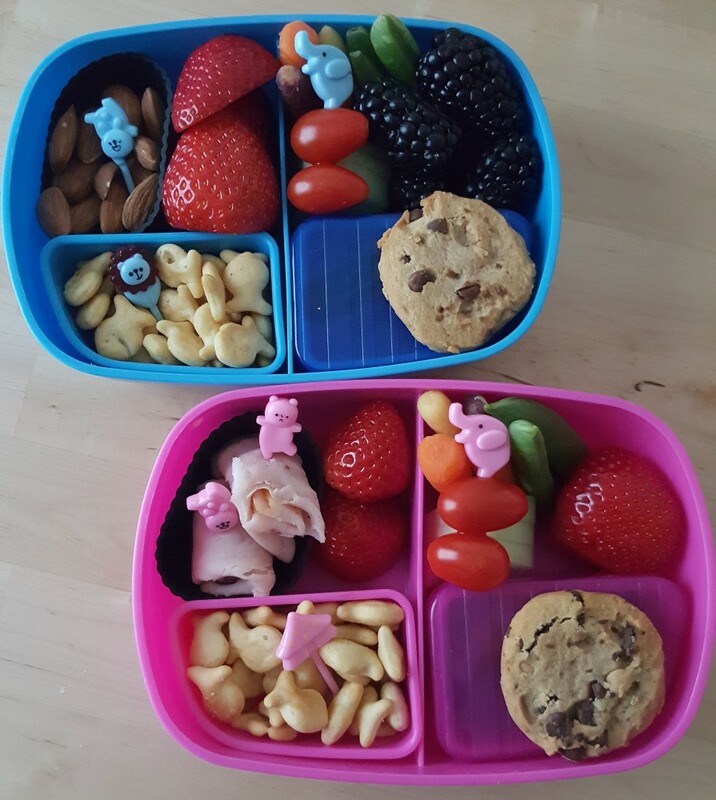 My son’s lunch is the upper one; he also had mango and pistachios. My daughters is below; she had a slice of cheddar cheese and extra pear slices. 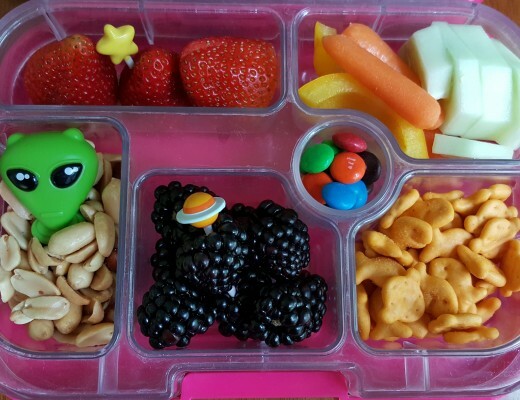 I included some cute animal bento picks for fun. 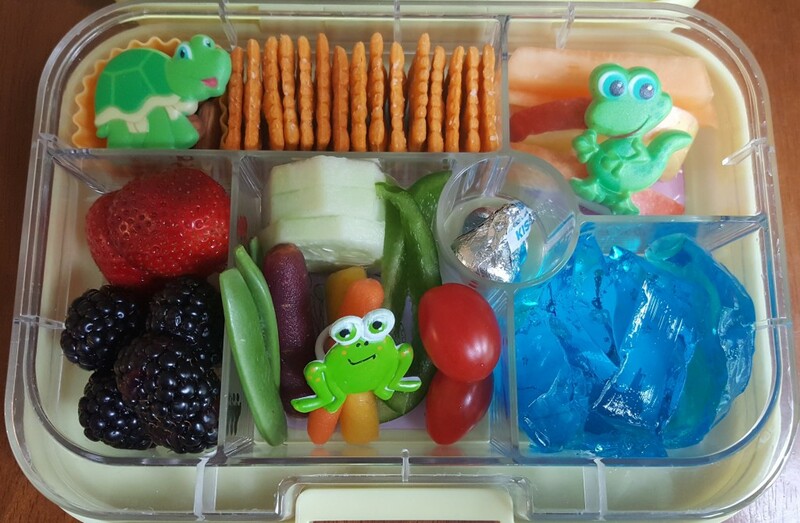 On Tuesday, lunches were packed in Yumboxes. These have a silicone lining in the lid and seal each compartment very well. These are handy boxes when you want to include something like Jello but you also want to ensure that the crackers stay crisp in their compartment. 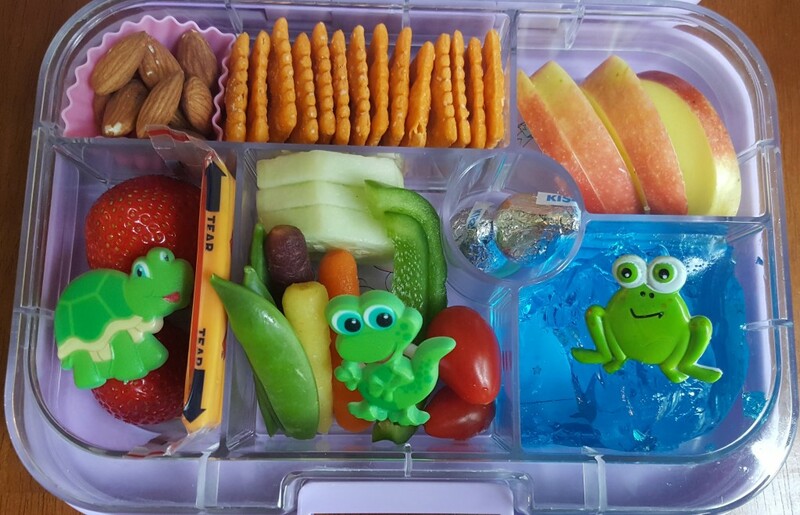 These lunches included almonds, the Big size of Cheez-Its, apple slices, strawberries, tri-color carrots, snap peas, cucumber slices, green pepper slices, tomatoes, blue Jello, and two Hershey kisses. 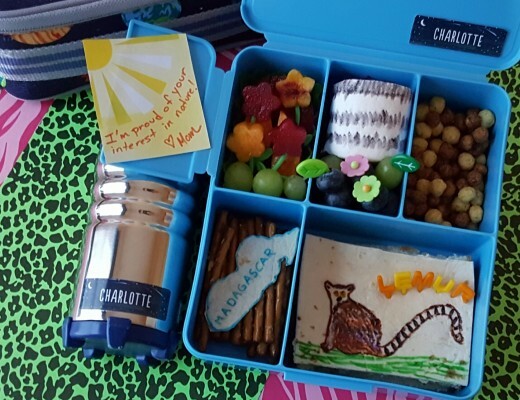 My daughter also had a slice of cheddar cheese in the lunch above. 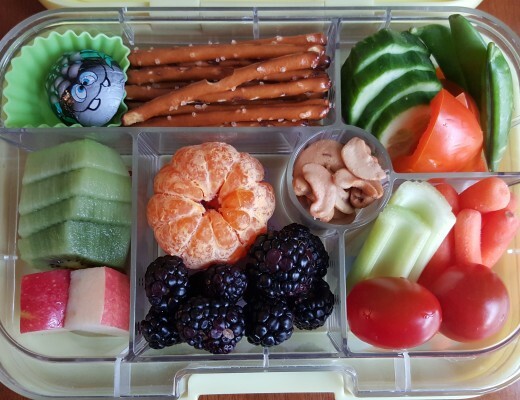 My son’s lunch is below, he had some cantaloupe in with his apple slices and a few blackberries alongside his strawberries. I included turtle, lizard, and frog rings for fun. 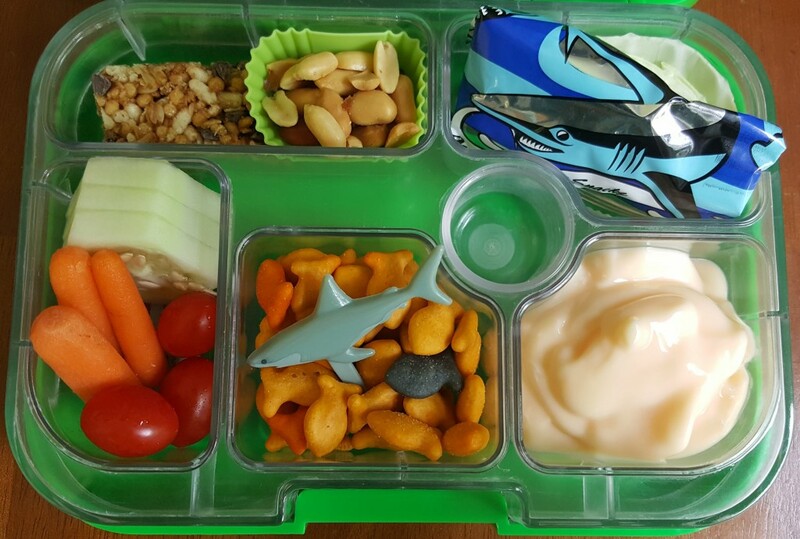 At the time, we had a couple of packs of shark-shaped gummy snacks leftover from a trip so they were the inspiration for Wednesday’s lunches. 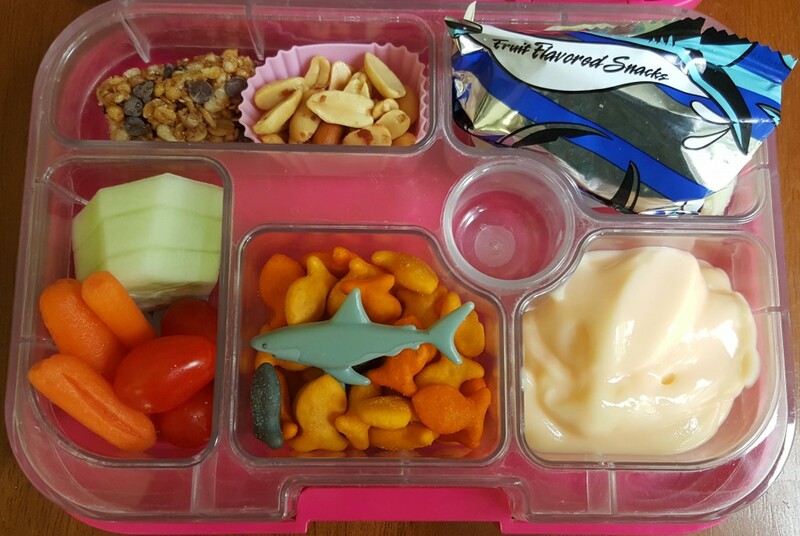 Both were packed in Yumboxes and included a piece of granola bar, peanuts, shark gummies with a slice of raw green cabbage tucked underneath, cucumber slices, carrots, tomatoes, Goldfish, and peach yogurt. I also included a shark cupcake pick. Thursday’s lunches, shown below, were packed in our Sassy boxes. 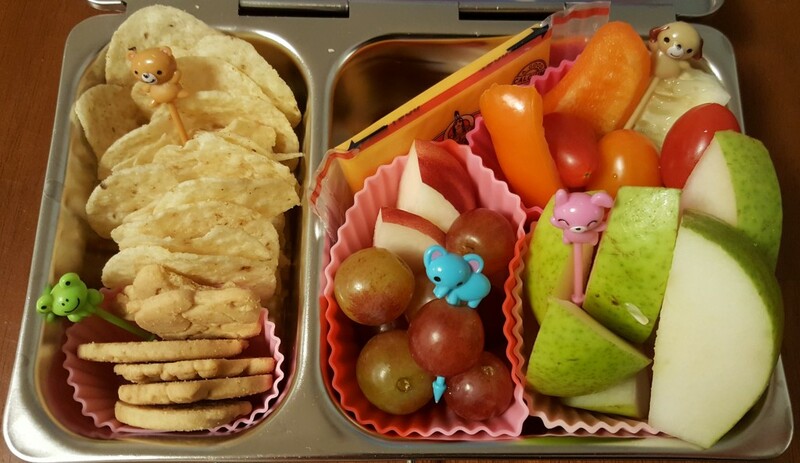 Here, my kids had the “saltine-like” Goldfish, a mini chocolate chip cookie, raw veggies, and strawberries. My son also had blackberries. He had almonds for protein and my daughter had deli turkey. I included color coordinating bento picks. 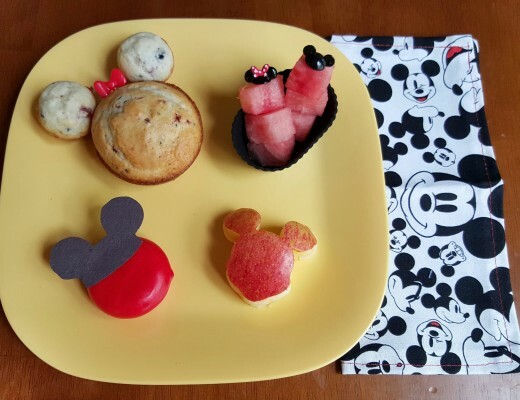 Friday’s lunches were Finding Dory themed with cupcake rings. 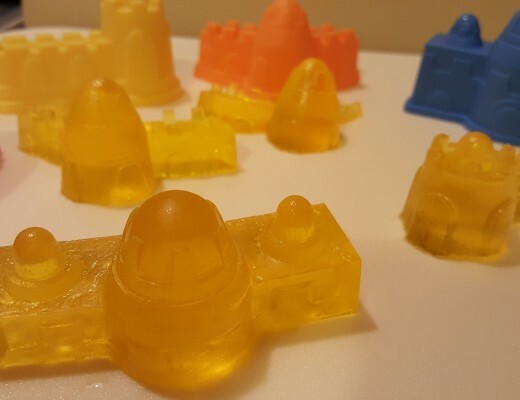 I poured Jello in one section of the tray of of the Yumbox and let it cool and set there. 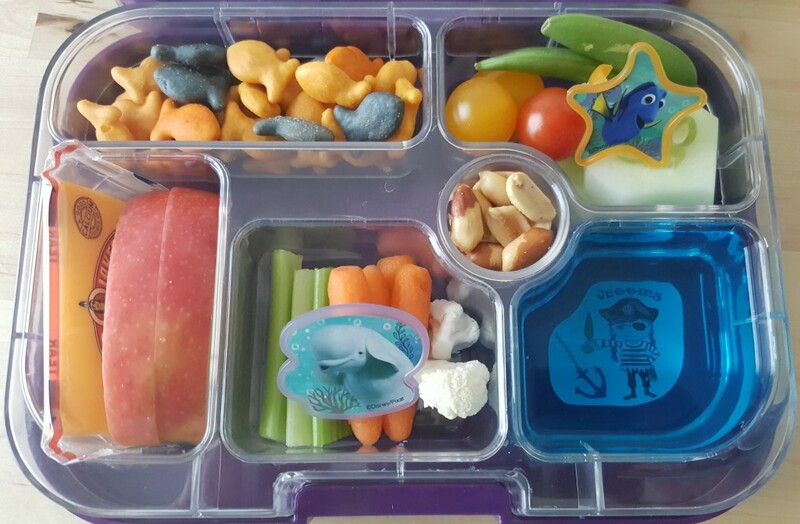 Other sections included Goldfish, raw veggies, white nectarine, and peanuts. 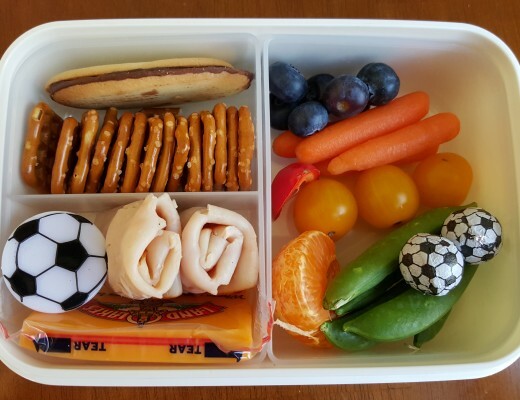 There you have it: ten lunches for two kids across five days of elementary school. 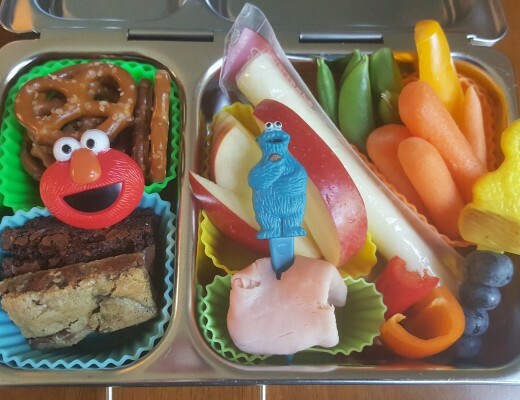 Hopefully this post and others on my site will help you find some ideas for filling lunchboxes this year!